Jose poses in high heels and short shorts. 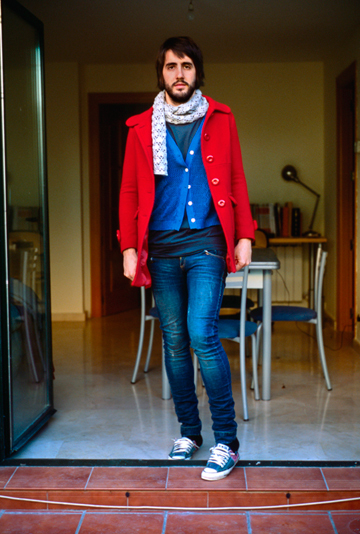 Spanish artist Jon Uriarte’s new portrait series, “The Men Under The Influence,” features photographs of men, under the influence of their girlfriends’ wardrobes. This provocative photo series seeks to spark a conversation about the changing roles of men and women in heterosexual relationships, using clothing as a marker for fluidity within those roles. 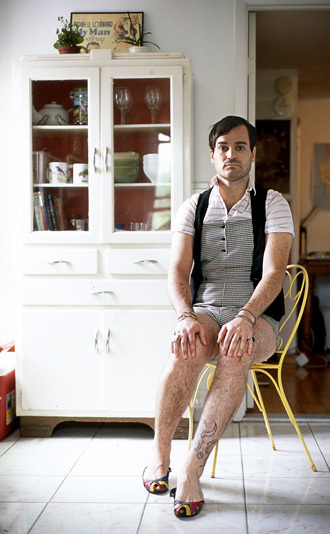 The men are photographed in their homes and workspaces, sitting or standing and looking almost completely normal, except for the fact that they are donning ill-fitting clothes made for women. There is no suggestion that these men are in relationships at all, unless you are familiar with the context of the images. equal partners. The project consists of full-length portraits of men wearing the clothes of their girlfriends or wives, taken in the space shared by the couple.” The portraits are really beautiful, and rouse a bit of intrigue, which is certainly what Uriarte was hoping to achieve. 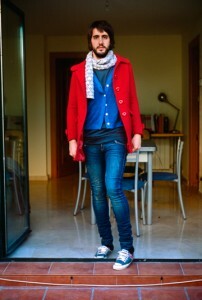 Santi wearing a red coat, cardigan, and skinny jeans. In the photographs you will find men of various body types staring thoughtfully into the lens of the camera, wearing skirts, dresses, shirts, leggings, and pants belonging to their female significant others. They have even tried cramming their feet into women’s shoes, their heels peeking out from the backs of the high-heeled or flat footwear. What do you make of these images, and the artist’s interesting social commentary using real couples as a tool? Take a look at the photo series at artist Jon Uriarte’s website.